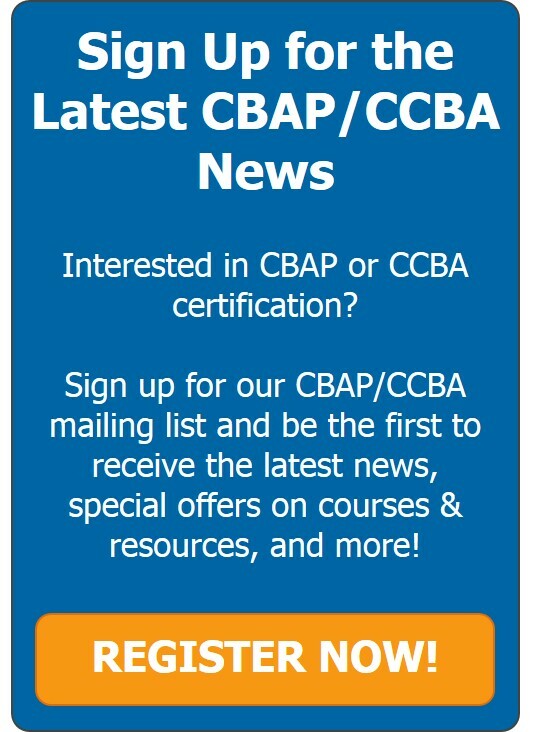 As we get closer to the changes happening to the CBAP and CCBA exams, we can report a few things we have learned. The IIBA is making progress in rolling out their new certification program and are releasing information on it in stages. Deadline. The rollout for version 3 exams has been announced for September 30, 2016. Our advice: If you are preparing to sit for the v2 exams, don’t delay your application – the deadline is near. Cutover. The exam changeover will be a clean one. IIBA announced that the latest date for taking v2 exams is Sept. 22. That means there is no grace period beyond that date. Our advice: Do not count on an extension. Retakes. IIBA announced they will waive the normal 90-day period for re-taking a failed exam. If you fail your v2 exam, you can take it again prior to the Sept. 22 deadline. This is good news and hopefully will reduce the anxiety level of people preparing for their exam. Our advice: Feel confident that if you fail the first time you can re-take the exam under v2. Even better: prepare well and pass the first time! Scheduling. We have begun to hear reports from our customers that scheduling their v2 exams is getting more difficult. Prometric, the official testing center for the CBAP and CCBA exams, has a limited number of slots available at each testing center. At our urging, IIBA has added more spots at Prometric sites to take both exams.The openings for the CBAP and CCBA exams can and will fill up depending on when you want to sit for your exam. Assuming an expected rush in August and September, it may mean you will have difficulty in scheduling your exam. Our advice: Apply now for your exam and get it scheduled to assure you get a spot in the exam center where and when you want it. Our CBAP and CCBA preparation classes and Anytime Learning programs provide the 21 professional development hours to qualify. We have a few remaining v2 classes this summer you can register for now. v2 Applications. Back in April, IIBA instilled a new application process, whereby you receive instant notification that your application has been accepted. Our advice: Get your application in now and submit your fees so you can schedule your v2 exam. In summary, IIBA has released several changes to their certification program, and more are going to be announced. Check on IIBA.org for official notices. Watch our blog and eNewsletters for announcements as we hear of them and as always, best wishes on getting your BA credential!